An irresistibly brilliant graphic novel adaptation of The Graveyard Book by Neil Gaiman, adapted by award-winning illustrator P. Craig Russell. This is the second of two volumes. After checking out The Graveyard Book Graphic Novel, Volume 1 last month, I was happy to receive the second and last instalment in the graphic novel adaptation of Neil Gaiman's, The Graveyard Book. I once again flicked through the lovely artwork before settling down to read it because it's such a nice book. :) This volume starts at chapter six and takes us to The End. Nobody Owens is a normal boy, but there's nothing normal about his life. After his family was killed when he was a baby, he ended up in the graveyard. Taken in, raised and educated by the ghosts living there, he's enjoyed many adventures. But he's all grown up now, and his curiosity about the world beyond the gates could tempt the past to catch up with him. This book--like the one before it--captures the original story very well. Showcasing Bod's tale through a visual medium that definitely works. Each chapter was illustrated by a different artist, and each gives their own spin on the story while still staying faithful to the original book. 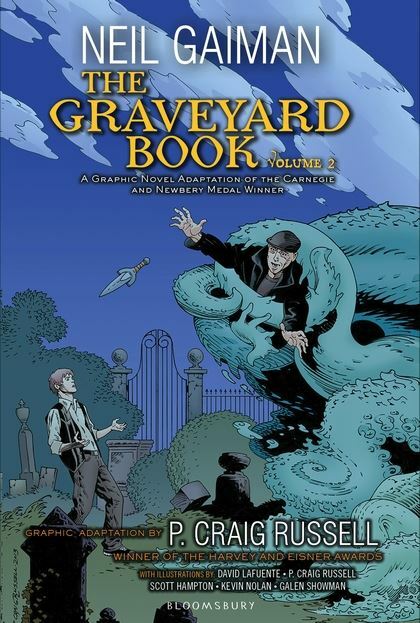 The Graveyard Book Graphic Novel, Volume 2 is a lovely, visual representation of Neil Gaiman's book and just like the first one, it enhances the original story. I highly recommend it for anyone who loved the story and wants to revisit this captivating tale.